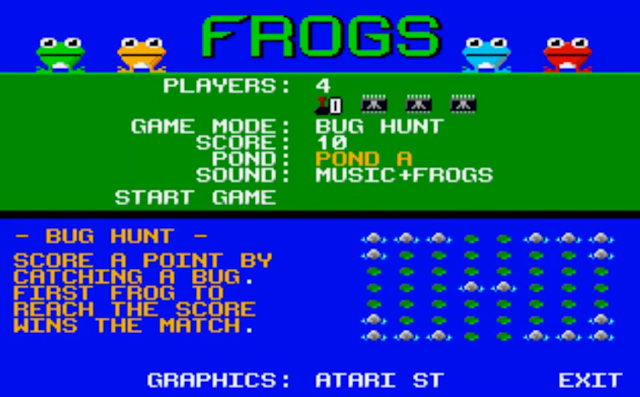 Indie Retro News: FROGS - C64 4 player homebrew classic gets an Atari ST port release! FROGS - C64 4 player homebrew classic gets an Atari ST port release! In 2017 we announced the release of the C64 4 player game ' Frogs ' which was developed by Christian Gleinser of Dr. Wuro Industries as a great game in which you play as a little frog that has to jump across from rock to lily pad, while trying not to fall in as the lily pads vanish or not being knocked off by your opponent. Well if you loved the game and have an Atari ST, you'll be pleased to know we have been contacted by ANARCHO Ride Laboratories that their Atari ST port of the game has finally been released! If that wasn't enough to get your retro senses tingling, you'll be pleased to know the game supports up to 4 players as it did on the C64, supports multiple control methods, computer controlled frogs, MIDI gaming with two ATARI ST(e)/Falcon/MIST FPGA, STe enhanced for faster gameplay and DMA sound, switchable between Atari STe graphics and C64, hard disk or floppy play, AND not only is the game free to download but if you have original hardware but no ST4PLAYER adapter, then stay tuned for the release of the ATARI ST Multiplayer Powerpack!